And now that we’ve written several personal memoirs (first & second drafts) and have polished one of them (third draft), it was time for our class to create some criteria that we felt was our own. We read each others’ polished personal memoirs and looked for characteristics of strong writing. Then at their table students brainstormed the characteristics/elements/attributes of strong personal writing — each one got its own post-it note. 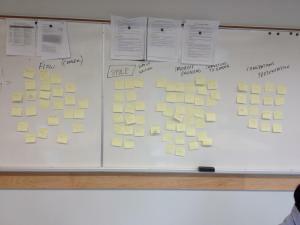 The post-it notes were grouped based on what they had in common. Tonight I typed them up in this chart.